How far have we come in 8 years with balanced filtering in schools? While many students recognize the need to shelter teenagers from inappropriate material and adult-oriented commercial ads, they complain that blocking and filtering software often raise barriers to students’ legitimate educational use of the Internet. Most of our students feel that filtering software blocks important information, and many feel discouraged from using the Internet by the difficulties they face in accessing educational material. In addition, many students describe schools that do not allow them to access their outside email accounts—the vast majority of students are not provided with school-sanctioned email accounts. In many cases, schools also prevent students from using instant messaging technologies, save their files to the school network, visit Web sites that teachers do not explicitly authorize them to visit, and—in perhaps the most extreme case we heard about—perform “right clicks” of their mouse to launch a (seemingly) innocuous pop-up menu within the Microsoft Windows operating system. How far have we come as a nation, in our public schools, in eight years when it comes to balanced content filtering? Some schools have come a long way, but many others remain in the dark ages. BalancedFiltering.org seeks to change this impasse and accelerate the pace of change in local communities when it comes to discussions about balanced content filtering. This entry was posted in Uncategorized on November 8, 2010 by adminwf. Last night I had the opportunity to share five minutes of passion and ideas about BalancedFiltering.org at OpenBeta5 in Oklahoma City. The lightning talks were recorded, and I’m hoping will be posted to YouTube soon. I’ll link and embed my talk here when it’s published. One of the exciting things I learned about at OpenBeta was we’re going to have a TEDx event in Oklahoma City this spring! See www.tedxokc.com for more details. The date is set for April 8, 2011. Once my OpenBeta5 lightning talk is published, I think I’ll submit it for consideration by the TEDxOKC organizers. In the meantime, I want to move forward with development of a “Balanced Filtering Online Gradebook” for schools and school districts. This will be a free tool useable by anyone, anywhere, and the app will log submissions. Submitter’s names and email addresses will be optional. The app, like ClustrMaps, will geo-locate the submitter’s location based on IP address. The simple web form will ask for school name and location too, however, since many schools are in the same geographic area. I sketched out the three parts of this process, as I’m envisioning it now, on my daughters’ whiteboard and took these photos with my iPhone. 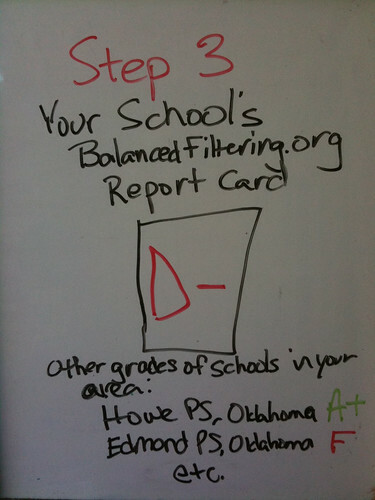 One of the important things I want to do with this application is draw attention to BOTH schools who are currently doing a great job with balanced filtering (like Howe Public Schools in Oklahoma) as well as schools doing a TERRIBLE job with draconian content filtering (like Edmond Public Schools in Oklahoma, where my two girls attend now.) Just as websites like MyEdu.com (formerly PickAProf.com) provide a level of public transparency, visibility, and accountability for aggregate rates of instructor/professor performance at universities, I want the BalancedFiltering.org “Online Gradebook” to make thousands of people in our communities take notice of how LOCAL school districts are handling Internet content filtering. Are school leaders enabling students to learn how to become responsible digital citizens? Does the district have a pro-active, well formulated strategy for helping promote perceptions of online accountability on as well as off-campus, or do district leaders think simply having draconian content filtering in place will suffice as a digital citizenship curriculum? I want to showcase and amplify school districts and school district leaders who ARE taking a balanced approach toward content filtering. I hope the site can (eventually) provide not only this “Online Gradebook” for school content filtering, but also a variety of tools and resources for educators, parents, church leaders, and others in our communities who want to engage in the dialog necessary to raise responsible digital citizens. The online gradebook is a step in this direction. I would love to “code local” with an Oklahoma City-based developer or developer team for this project. If you’re interested, please contact me. If I can’t find someone in Oklahoma to work with, I am certainly open to other offers. I also am considering posting this as a job for bid on Freelancer.com. I was pleased with the results of a small webscraping job I posted there over the summer, and have a couple friends who have had good outsourced coding experiences on similar sites. If possible though, I’d like to work local. As OpenBeta OKC showed last night, we have an AWESOME group of creative and passionate geeks in Oklahoma! This entry was posted in Uncategorized on October 29, 2010 by adminwf. The National Conference of State Legislatures (NCSL) has a good website comparing state Internet Filtering Laws. I’m not sure if this is being maintained, last update as of this writing (2 Oct 2010) was Dec 2009. 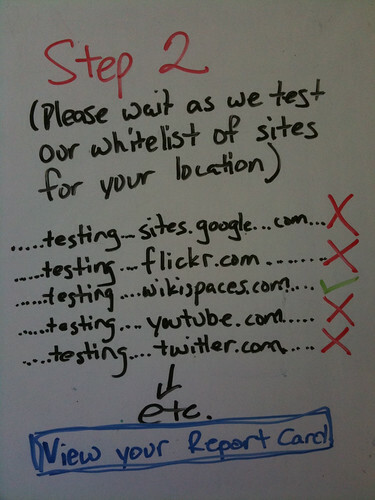 I was very interested to learn that here in Tennessee, where I’ve been for the Martin Institute‘s fall 2010 conference, all public K-12 schools are required to have Internet filtering which is CENTRALLY MANAGED by the state. This means there is NO local autonomy for individual schools or districts to determine their own whitelists or blacklists. I wonder how many other states are under this type of centralized filtering regime? It seems to me an advocacy campaign which sought to legally enable local schools to adopt and maintain their own Internet filtering policies is needed. Local control is an essential value of our public school system in the United States. Centralized management of Internet content filtering by a state authority lends itself naturally to highly conservative and reactionary policies which may significantly impede the use of digital resources to support learning in the classroom. That’s a nice way of saying, Tennessee state-managed content filtering is (in the perception of some) draconian, heavy-handed, and unbalanced. If you’re an educator working in Tennessee today, what’s you’re view on this? Do you know of other states in the United States which centrally manage Internet content filtering for schools? This entry was posted in Uncategorized on October 2, 2010 by adminwf. Many public schools in Oklahoma practice draconian filtering of Internet content which makes China look permissive in comparison. A social action campaign is needed to advocate for balanced content filtering in our schools which complies with the law, encourages accountability, and helps prepare our students to be responsible digital citizens. Wesley Fryer is an educator, author, digital storyteller, husband, dad and educational change agent. In addition to regulary seeking out the best restaurants for fried chicken and soup dumplings worldwide, he promotes constructive ways to disrupt our educational status quo and support a blended learning revolution. Wesley blogs at speedofcreativity.org and is the executive director of Story Chasers Inc. based in Edmond, Oklahoma. All OpenBeta presentations are video recorded and subsequently published online. Wesley’s presentation about BalancedFiltering.org at OpenBeta5 will be shared here following the event. This entry was posted in Uncategorized on September 28, 2010 by adminwf. The need for US public schools receiving federal ERate dollars to comply with provisions of CIPA and other laws. The need to provide accountable online environments in our schools. The need to equip students to make responsible, ethical decisions in online as well as face-to-face situations. Please subscribe to BalancedFiltering.org via email or using your favorite RSS/news reader. 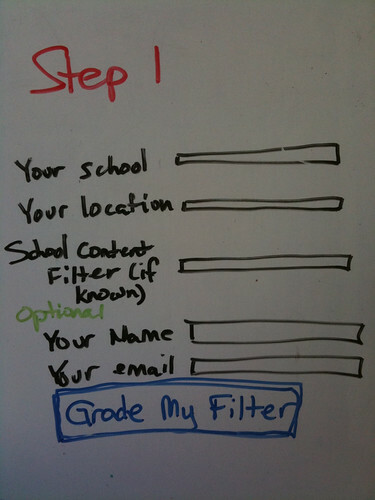 Do you have a story about balanced (or unbalanced) school content filtering you'd like to share? If so, email it to "post@balancedfiltering.posterous.com" and our site moderators will consider it for publication here.